Our Africa Geographic Photographer of the Year 2016 competition has received many great entries, with wildlife photography in particular blowing our socks off. 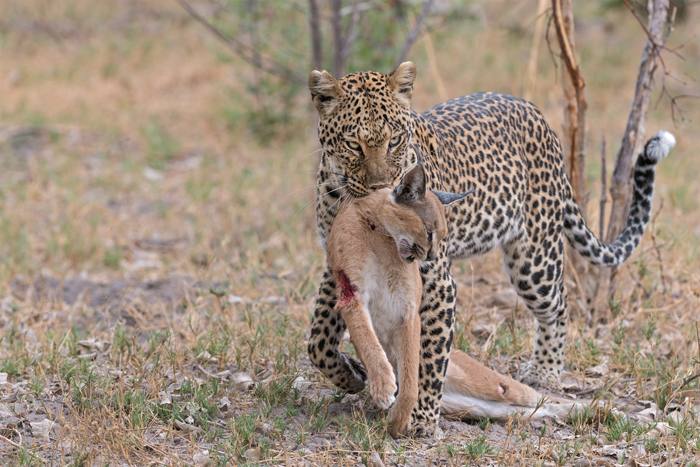 But when we recently received this image by Dietmar Willuhn, captioned “dangerous encounter”, we just couldn’t help but wonder what the story was behind the photo. 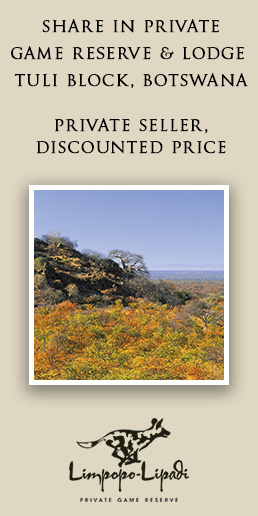 “Observing Africa’s big cats is one of the most impressive highlights during a safari. Sometimes these sightings take a dramatic turn, and an interesting sighting turns into a ‘once in a lifetime’ adventure. “This particular sighting happened in early November of 2012 as we went out for a morning game drive in the Selinda Reserve, which is located in northern Botswana. 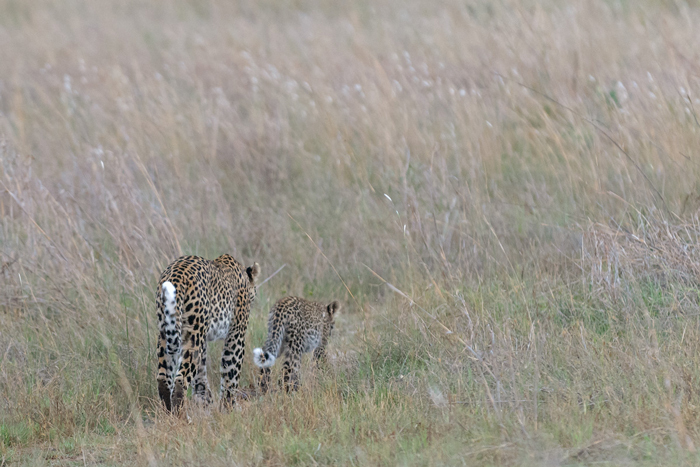 In the first hour of our game drive we spotted a leopard and her cub. 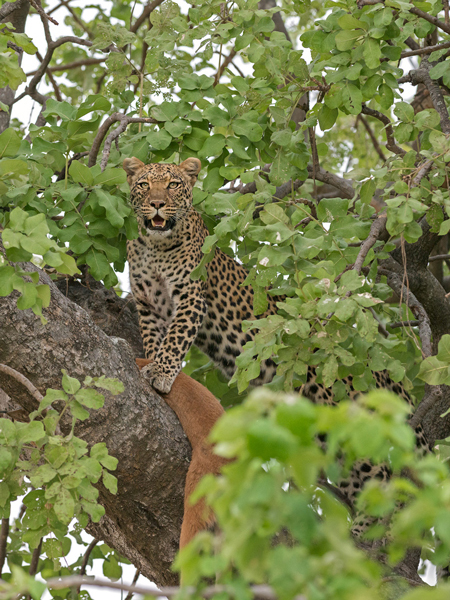 “Because Selinda is a private concession that offers the possibility to go off road, we were able to follow the leopard for some time. The peaceful situation suddenly changed when the leopard left the small cub hidden in the bushes to continue on her own. 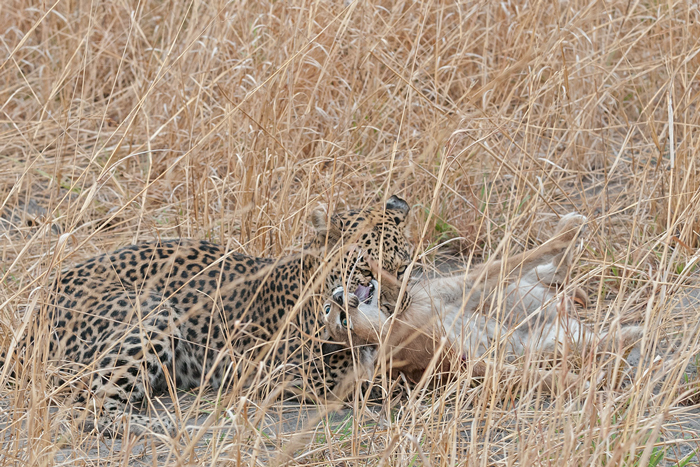 The adult leopard went into hunting mode and potential prey was not far away as some impalas were grazing close by. 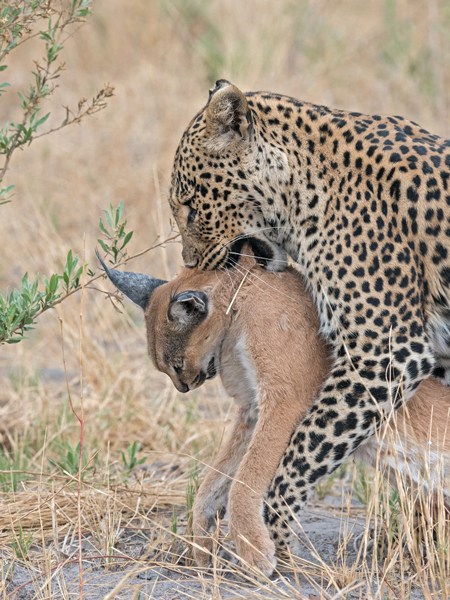 “The leopard started creeping up on the impalas, maintaining cover in the dense and high grass. We lost sight of her a few times, and during one of those moments, loud and roaring sounds of a battle resonated through the bush. We carefully approached, cameras at the ready, but when we saw what was going on, we needed some time to realise what was actually happening. 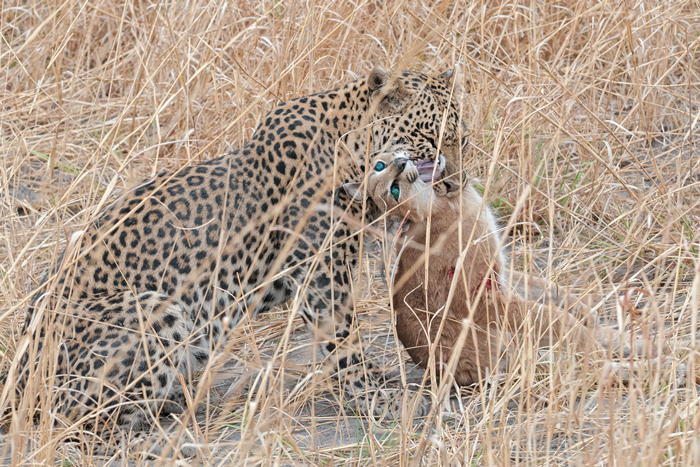 We were observing a fight between the leopard and an adult caracal. 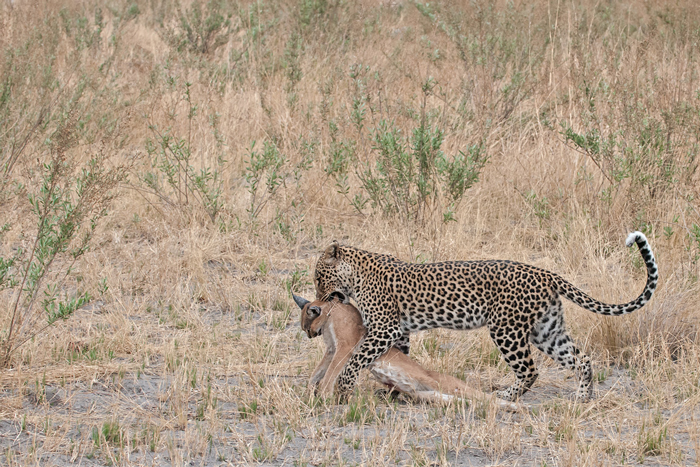 “The fight between the two big cats ended fast with the leopard targeting and killing her opponent with a bite to the throat. 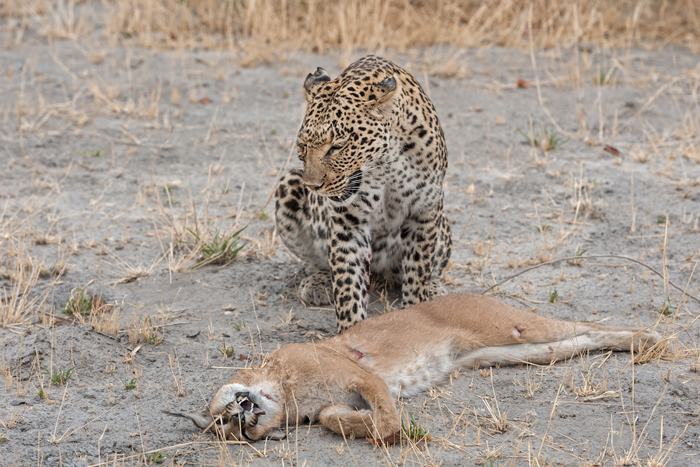 “It is possible that the nocturnal caracal had been sleeping in high grass and had no chance to ward off the attack when the leopard appeared on the scene. “Territorial fights among big cats are common and would explain the unusual situation. 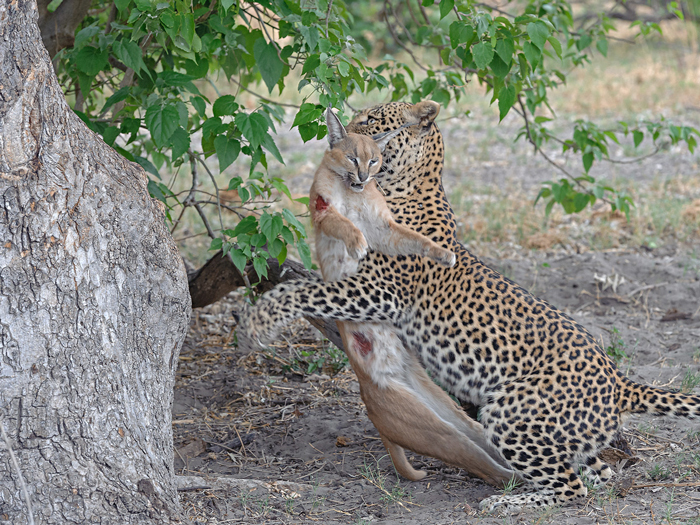 But we were astonished when the leopard began carrying the caracal up a tree, as leopards usually do this to protect their prey from other predators.